The guys from Emerald Triangle Seeds crossed two of the strongest, most beloved and desired sativa-dominant hybrids in the world to create this symphony of flavors. Emerald Jack grows tall quickly, doubling in size after moving into the flowering cycle, so don’t be afraid to flip it early indoors. Be sure to stake these early and often or employ a trellis to support the massive terminal bud growth. Healthy doses of nitrogen, calcium and magnesium will be essential in getting the plant to its full potential. You will be rewarded for your labor by a thick harvest of resin-encrusted colas. The tropical fruit salad of the Jack Herer collides with the intense sour of the Emerald OG to create a tangy, unique taste that lingers on the palate. 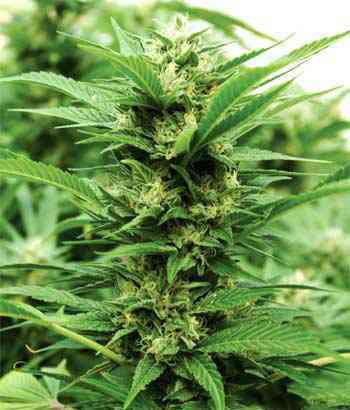 Emerald Jack produces an uplifting, energetic high, stimulating creative and euphoric thoughts.